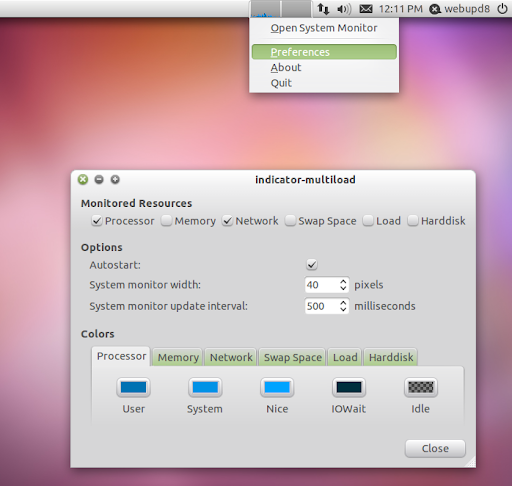 Yet another much requested AppIndicator is now available for Ubuntu 11.04: an indicator to display the network speed as well as CPU, Memory usage and more called System Load Indicator (or "Indicator Multiload"). This is a port of the original System Monitor GNOME Panel applet to appindicators and Vala. This means it has most of the features the System Monitor Applet had: display processor, memory, network, swap space, load or hard disk activity, change the colors and so on using an Ubuntu indicator..
Once installed, launch System Load Indicator from Dash. Important: System Load Indicator is still in alpha! Report any bugs you may find @ Launchpad.